The provincial Department of Culture, Sport and Tourism reported that around 65,000 tourists visited the province during the first seven days of the holiday. The two famous local attractions – Ganh Da Dia (Da Dia cliff) and Bai Mon- Dai Lanh Cape – drew more than 41,000 sightseers. According to the department, most local hotels have been fully booked during the third to fifth days of the lunar new year, but prices have been kept stable. Several traditional festivals in the province have started, keeping the flow of visitors. 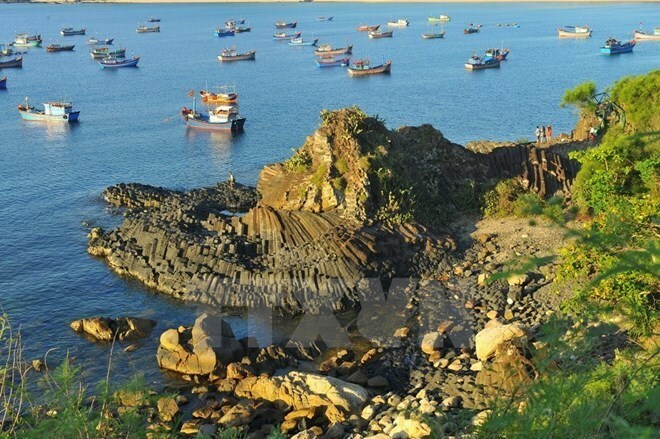 Phu Yen welcomed around 1.6 million tourists in 2018, including 41,000 foreign visitors. The province aims to attract more than 1.6 million visitors this year. Phu Yen is one of the most beautiful provinces in the central region of the country. It has nearly 190km of coastline bordered with zigzag mountains and dotted with many bays, lagoons, cliffs and reefs, along with many large and small beaches that are described as primitive. One of the best known destinations in the province is Dai Lanh Cape, which offers visitors a special feeling. There, one side is the green mountains and forests while the other side is the deep ocean with its blue colour combined with the light blue colour of the sky as well as multi-shaped vertical cliffs. Under the cape is Mon Beach, a very clean and stunning beach where freshwater flowing from high mountains creates a lovely picture. Another favourite place for visitors is Da Dia Reef which was recognised as a national heritage site. Looking like an orderly beehive, the reef is made of thousands of pentagonal rocks, causing passers-by to stop and contemplate the unusual and magnificent work of nature.